Today I am showing you some little tealight boxes I made a couple of weeks ago for a Christmas Present Evening at a friend's house. Each of them held three red or green tealights which were decorated with some matching DSP. 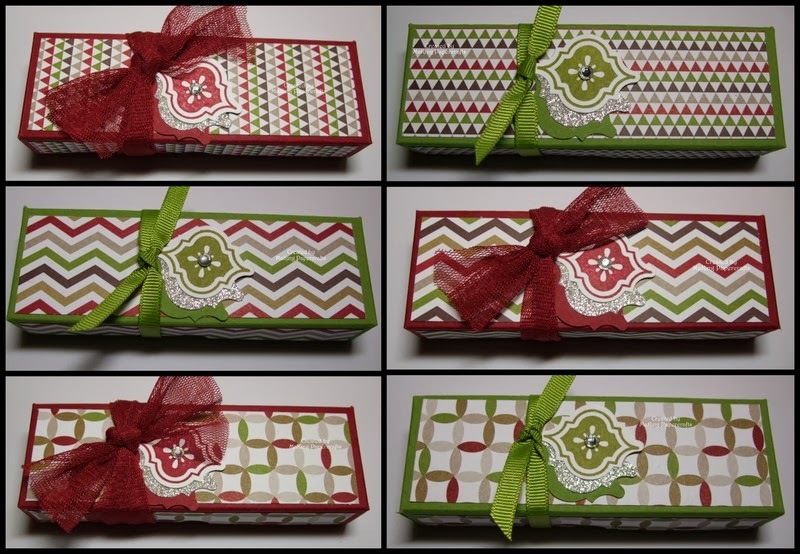 The boxes were made with Old Olive and Cherry Cobbler cardstock along with the co-ordinating Season of Style DSP and tied with Old Olive and Cherry Cobbler ribbon (both now retired). The embellishments were made using Mosaic Madness and the co-ordinating Mosaic Punch with a little Silver Glimmer paper. These are really lovely Margaret! Thank you for your lovely email the other day...I have meant to reply but everytime I think about it, I end up doing something els!